This section contains custom figures of characters found in Episode 4 - 6 of the Star Wars saga. Many of these figures are simple enhancements to existing figures by applying additional paint work, while others are total conversions into entirely different characters. Bast was and Imperial General that served as a Chief on the first Death Star. He was the Officer that warned Grand Moff Tarkin of the potential destruction of the Death Star and urged Tarkin to evacuate. I created the General from a Director Krennic figure with several modifications. I removed the pistol holster and grenade canisters from the belt and sculpted on the hat and sideburns. The rank badge on his chest was also trimmed down to the appropriate size and repainted. The entire figure was given a coat of Field Gray paint and the hair was painted an auburn color. The eyes were also repainted to a dark green color. Colonel Yularen was another Officer seen on the first Death Star in Episode 4. This guy was quite distinct in his beige colored tunic and was seen at the Death Star conference table and walking past Han and Luke while they are disguised as Stormtroopers. His body was modified a bit more extensively than General Bast, since the beige tunic has a slightly different pattern. The seam on his left side had to be removed and the overlapping breast had to be shortened so it was even with the bottom of his collar instead of going all the way up t the shoulder. The front flap was also reduced so it doesn't overlap onto his right side as much. The rank badge also had to cut down to a single row and his chest pockets removed. For the head I re-sculpted Krennic's hair style to give the widows peak and combed back hair, and also added the mustache. Once the head was repainted and he had his distinct arching black eyebrown, you can barely tell it used to be Krennic's head. This figure is loosely based on Commander Praji; one of the black uniformed Officers from Episode 4. The conversion for this Officer was similar to the others I have made so far; with the removal of his rank cylinders and a modification to his rank insignia. Some of the gear war also removed from his belt but unlike the others, this one got to keep his holster. Oddly the pistol holsters on these black uniforms are brown rather than black, so they look a bit out of place. I wanted to stick with screen accuracy though so I used the brown color for the figure. The head for this figure is from a Marvel Legends Tony Stark with his beard removed and some sideburns added. I sculpted the hat from scratch and gave his entire uniform a coat of flat black paint. The pistol is a from Director Krennic with the barrel shortened and the scope repositioned so it resembles a DL-44 blaster. The security sergeant is seen in the first Death Star directing squads of Naval Security troops, he is simply a Naval Security Guard with a black hat on instead of the large helmet. All this figure needed was a hat and a head swap to get him going. I repainted one of my leftover Krennic heads for this guy and modified the neck socket for a better fit. The hat is one of my custom sculpted designs and is removable. In the Original Trilogy three different TIE Pilots are shown with extra details painted on their helmets in dark metallic silver. I decided to replicate these marking on three of the Black Series 6" TIE Pilots to make for a more impressive display. All the helmets were given their appropriate serial numbers on their foreheads. The helmet on the left has the metallic markings on his side tubes of his helmet, the helmet in the middle has the metallic stripes on his faceplate and the little piece below the serial number on his forehead, the one on the right has the metallic crest on his forehead. I also painted the teeth and chin vents silver on all three helmets to match the movie prop helmets. In order to make the goggles stand out from the black helmet, I gave them a coat of black tined with a small amount of dark green, and covered it with a gloss clear coat to give them a more realistic look. A pic of the three TIE Pilot variants together. A closer view of helmet details. The AT-AT Driver has always been one of my favorite Imperial troops, and I really wanted one for my 6" collection. Since its likely to be a very long wait for a 6" AT-AT Driver to be released, I decided to create one from a TIE Pilot. This requires a number of changes to the figure in order to be accurate. The helmet had a ton of small details to be added including the devices beside and above the eye lenses, several little tabs and buttons on the forehead, and little vent pieces to fill the holes where the air pipes had been on the chin of the helmet. The Empire logos and the black stripes on the side tubes of his helmet are custom decals, with the remaining helmet details hand painted. The air pipes themselves had to be replaced with longer hoses and connected to the rear of the helmet with custom made canister fittings. The control box on the chest required the buttons to be shaved off and a new control panel decal added, with several new buttons sculpted on. The breastplate of an AT-AT Driver has a different style of shoulder straps than the TIE Pilot, so these had to be shaved down and re-sculpted. The standard Imperial belt worn by the TIE Pilot was removed and in its place the AT-AT Driver harness was added that hangs from his chest armor and wraps around his legs. For the electronic style plaque on his back-plate, I used a decal mounted on a thin piece of transparent plastic card and sculpted some additional details as needed. On the arms I had to sculpt the proper shoulder armor on both sides and cover up the communicator electronics on the left forearm. The cuff of the gloves was also reduced and slightly re-sculpted so they don't flare out as much as the TIE Pilot gloves did, and a new communicator was added to the cuff of his left glove. The legs required no modification other than to re-sculpt the boots to be the more puffy padded winter boots as used on the movie prop. I painted the figure to be accurate to the actual movie prop, which had armor that was actually light gray. The bright studio lamps used for the promotional pictures made the armor appear white in most shots. Since many of the parts didn't match perfectly in color on the prop, I did the same with the paintwork on the figure. The gloves are a slightly lighter shade of gray than the armor, almost an off white just like the real welding goves used on the costume. I also painted the web harness around his legs in a slightly different shade of gray since being cloth, the straps didn't match his painted armor precisely. The boots on the costume appear to have been overpainted with the same gray as the armor (paint smudges from this can be seen on his boot tread in some of the behind the scenes photos), so I did the same here although I left off the paint smudges since it looked messy. The completed AT-AT Driver from several angles. The Imperial Gunner is another rarely seen trooper that I always really liked the look of, and really wanted one for my 6" figure collection. Fortunately this is another figure that can be created from an existing TIE Pilot, though the changes required are much more extensive than the AT-AT Driver. 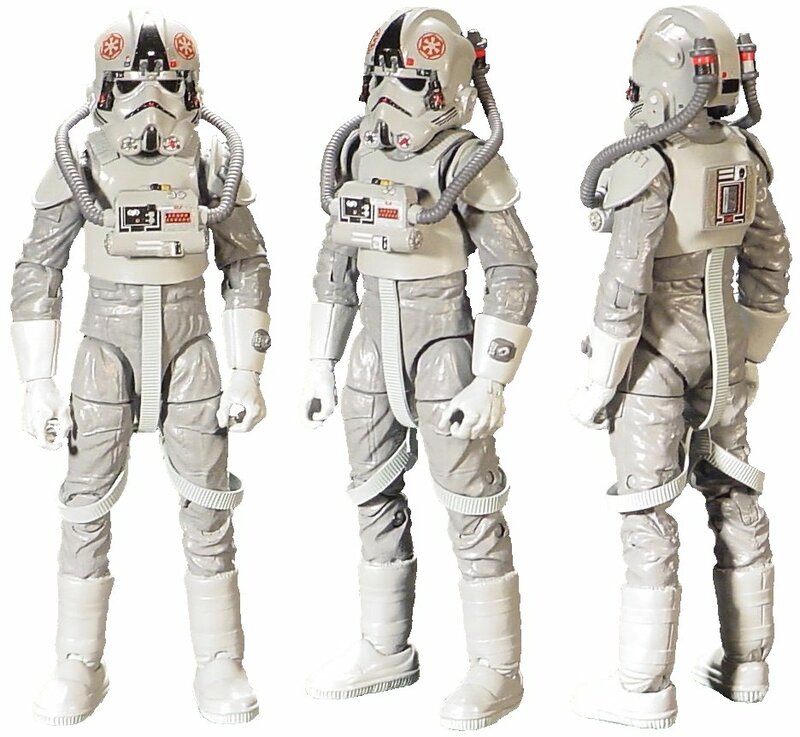 There are several versions of the Gunner with some differences to their uniform; one operates the Death Star super laser and has a black jumpsuit like a TIE Fighter Pilot, the other operates the defensive turbo-laser batteries and has a black leather jacket with a ribbed pattern on it. Both gunners are seen with and without a padded breast plate. The one with pilot jumpsuit would be much easier, but the leather jacket version looks so much better that I opted for that version despite the additional work required. The head for this figure needed to be created from scratch, since no other figure at this point has a helmet shape that can be used as a base. The main part of the helmet and faceplate were made from Sculpey clay and baked. A thin strip of plastic was then used for the visor and the helmet's rear panel was cut from a plastic Easter egg. The helmet communicator was hand sculpted and a piece of wire added for the antenna. The ribbed pattern of the leather jacket was sculpted onto the sleeves and the lower front portion of his torso. The back of the jacket does not have the ribbed pattern but still needed to be resculpted to cover up the removed back plate of the TIE Fighter Pilot. The padded breast armor was sculpted as a separate piece and glued on afterwards, with the straps for the breastplate being sculpted once it was attached. The final touch was the addition of two silver boxes to the belt and the placement of three white Imperial Insignia. Some various shots of the Imperial Gunner. I have always thought the Snowtrooper Commander was much cooler than the basic troopers with his molded faceplate and rank insignia, so when the basic Snowtrooper was released I immediately set about making a Commander of my own. While not immediately noticeable, the Commander actually has a large number of differences from the basic Snowtrooper, and required quite a bit of modification to get him film accurate. The most apparent difference in the Commander's molded faceplate, which stands out compared to the wrinkly cloth face cover on the troopers. After sculpting on the faceplate I also added the two little silver discs on the sides of his helmet. The breastplate also has a number of changes to the standard trooper, most noticeable being the rank insignia on the chest. In addition, I also had to rework the three control panels in the center of the breastplate. The center panel had to be completely redesigned with a new set of buttons and switches The small panel on his right side had two small buttons added, and the panel on his left has the three red buttons removed and a grooved cover added. This left panel also had the gray outlines added to the sides to match the film prop. An armor plate was also added to his back in place of the backpack, with a number of buttons and details added. For the arms a number of changes had to be made. First off, the shoulder pads had to be removed and rotated upside down so the little row of raised squares is on top. The forearms had to be completely remodeled by adding the Stormtrooper armor bracers with AT-AT Driver style gloves on over them. The belt also had to be modified by removing the large cargo pockets and adding a pistol holster. The pistol is a custom design created by shortening the barrel of a Director Krennic pistol and re-positioning the scope. The legs also required a couple of changes. The Commander does not have kneepads, so those had to be removed and the knee area re-sculpted as part of his pants. 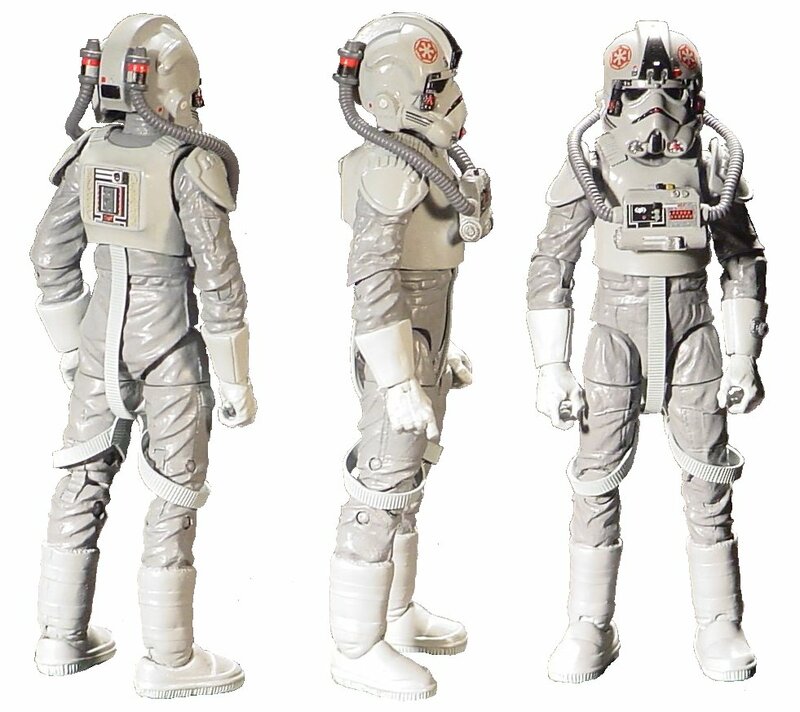 The boots are also different from the standard trooper, the Commander wears the same type of boots as the AT-AT Driver so those had to be sculpted on as well. The remaining bounty hunters from the Empire Strikes Back have been a long time coming, so I decided to make one of them myself using a C-3p0 body as the base. The only modification required to the body was on the breastplate. Unlike the normal 3p0 torso that has a human style breast, this one is more of an insect style design with three overlapping breasts on each side. I added this with some kneadatite sculpting putty, and at the same time I removed the two little pistons on the base of the neck. Aside from that the body was a straight repaint of 3p0. From what little information I could find, the original movie prop of this droid was a very dark blue metallic paint. The color could look black or dark metallic gray depending on the lighting used. The whole body was sprayed with metallic navy blue and then a red marking was added to the breastplate. All of the abdominal wiring was repainted silver and the whole body was weathered with several washes of a thinned down orange brown color. The head was acquired from a seller on eBay and I think it is an enlarged re-cast from the head of a 3.75" Hasbro figure. It was painted gunmetal metallic and washed with thinned down black paint. The nozzles on the face were painted bright silver and used the same black wash. For the eyes I started with a dark green metallic and then added a wash to the gaps with thinned golden orange paint. The blaster rifle is a spare from the Hasbro 6" Sandtrooper.